How did everyone make out yesterday? Did anyone else create a plan of attack for organizing their kitchen? I know a number of you really liked the personalized cover page. If you put in a request for one yesterday hang on, because as soon as I’m finished here I’ll be getting those sent out to you. If you don’t know what I’m talking about you can check out Day 1 here, near the bottom of that post is a form you can fill out to get a free personalized cover page. I got a rough plan done up yesterday, and thanks to thinking it through I’m shuffling around my to-do list a little bit. Knowing what you want to end up with can help save you a lot of time. For example, our pantry is a big wasteland of disorganized chaos. Despite our best intentions, things get put back in the wrong place, or shuffled to the back of the deep shelves and forgotten. Coming up with a system for our pantry is one of the bigger projects I’m tackling this month. After comparing my plan of attack with my plan for this blog series, I realized that I needed to shuffle some things around. 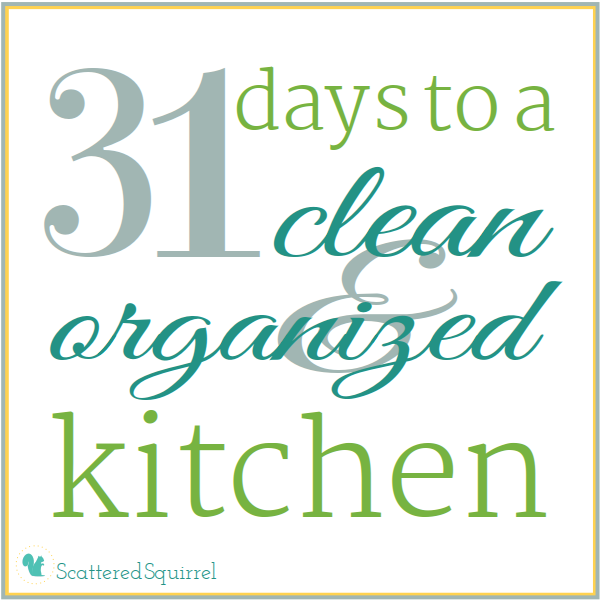 I’m planning on tackling the pantry this weekend, when I can take the time to get it done and not feel rushed. 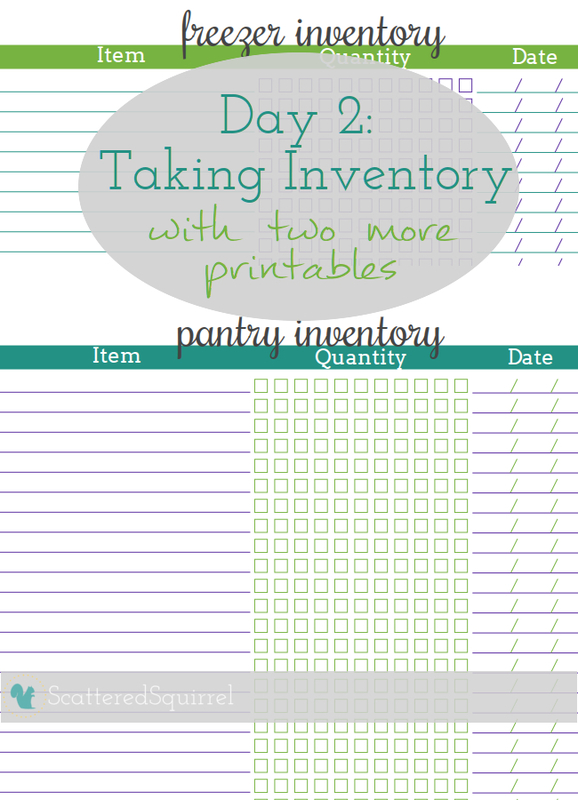 One of the items on my list of printable to make and share was a pantry inventory form. It’s one of tools I’m going to be using to keep our pantry organized, and also to make sure we’re not buying something we don’t actually need because we have half a dozen hidden in the depths of the shelves. My original plan had been to share it later on this month, but then I got to thinking. 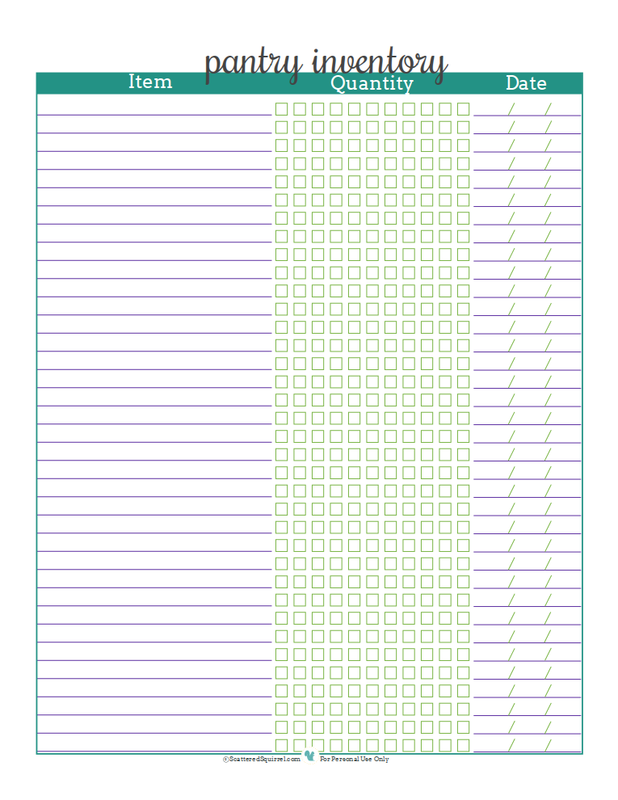 I’m going to be pulling everything out of the pantry when I reorganize it, so why not have the printable done up first, that way I can take inventory either when I empty it, or when I put everything back. It would save some time later on right? Well, that’s exactly what I did! An inventory sheet is a great way to keep track of what you have and what you’re running out of. You could hang this near your pantry and mark items off as you use them, or maybe you prefer to take inventory just before you make up your grocery list? I’m planning on working an inventory day into my weekly schedule, at least until I get the family trained to mark things off as we use them. When items come in I’ll mark each check box with a line, when we use an item we’ll mark a check box off with another line making an ‘X’. Obviously some items won’t need that so much, like flour and sugar as we buy large bags of those, but soups, cereals and other non-perishables will need the space. 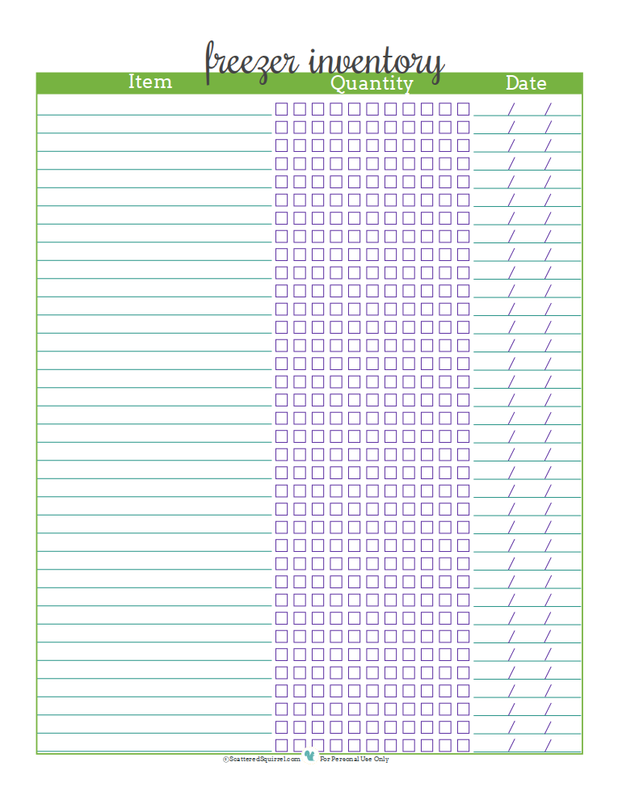 I also decided that I wanted my inventory sheet to help me figure out and plan our grocery budget a little more, so I include a ‘date’ column. This will be especially helpful when it comes to planning for buying the larger items such as flour and sugar. At least that’s the plan. 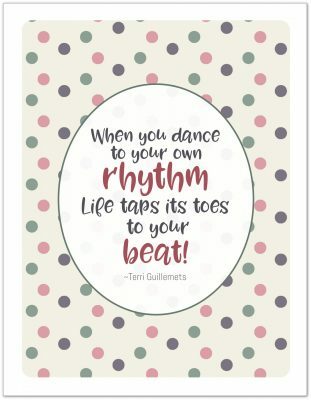 Funny things happen when I work on printables. Sometimes I look at one I’m working on, and I think “gee this would make a great _____!” as was the case with this one. I realized that by adding the ‘date’ column, I had not only a pantry inventory sheet, but a freezer one as well. Nothing is worse than going into your deep freeze and finding a roast only to discover it’s freezer burnt because it’s been there for a year. Sadly, our deep freeze bit the dust a few years ago, and we just haven’t replaced it yet, though that is on my list of things to look for every time we go out shopping. I’m waiting for a great sale to come along. With only the little fridge freezer, I don’t have to worry about stuff staying in there too long, but I’m sure this little printable will be helpful to many of you. So, that’s what I’m up to today. Getting the inventory sheets printed and ready for use. I’m thinking of organizing the inventory by shelf, maybe do two shelves per page? I’m not sure yet, maybe I’ll list them by category? Maybe I’ll make up some more to share later in the month with categories on them, would anyone be interested in something like that? As always to snag a copy for yourself, just click on the pictures! And don’t forget to fill out the form to get your own cover page. Do you use a pantry or freezer inventory sheet? Do you find it works well?